Spice by Chris Salans in Ubud will celebrate Christmas with a special Christmas menu offered from the 24th to the 30th of December, served daily from 12pm until 10pm. Chef Owner Chris Salans and his team of chefs will recreate Christmas classics and give them an Indonesian spin. 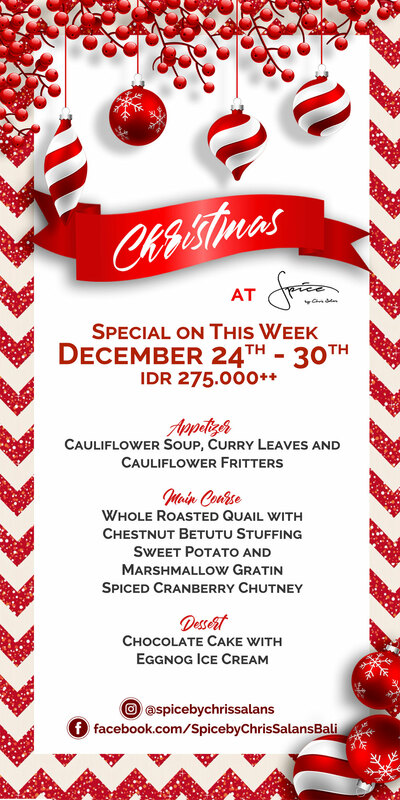 The festive 3-course menu will be Rp275,000++ for food only. There will be an optional special cocktail and wine pairing – two cocktails and one glass of wine to match the three courses of the menu. Make your holiday a happy one at Spice and bring the kids!